The 2010 Census results are in. The headlines: men are living longer; marriage isn’t. But above age 85, the number of women is double that of men. Female life expectancy is 80.8 years; male, 75.6 years. Baby boomers are aging: The 45-plus group grew 25.6 percent since 2000, while the under-45 group only increased 1.4 percent. The median national age was 37.2 years, from 35.3 in 2000. Seven states now have a median age of over 40. Maine is oldest, at 42.7; Utah is youngest, at 29.2. The share of U.S. households with married couples fell to 48.4 percent, down from 51.7 percent in 2000– the first time the number dropped below 50 percent. In 1950, married couples made up 77 percent of households. More descriptive demographics in this AP report and at the Census Bureau’s site. As we do our best to age gracefully, we might recall that it was on this date in 1933 that Walt Disney’s edifying fable “Three Little Pigs” was released. 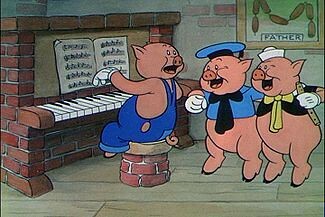 Winner of the 1934 Academy Award for Best Animated Short, “Three Little Pigs” was ranked #11 on the list of 50 Greatest Cartoons, and was selected for preservation in the United States National Film Registry by the Library of Congress.